I've been a fan of BioWare for a long time. This company has developed some of the best Western RPGs out there. Baldur's Gate, Neverwinter Nights, Star Wars: Knights of the Old Republic, and Mass Effect are all great games. However, their undying masterpiece and their greatest game is undoubtedly Dragon Age: Origins. The game is a D&D Forgotten Realms Campaign, set in the fictional universe of Ferelden. So, what makes this game so great? The gameplay might add nothing to the traditional gameplay of Western RPGs, but it's flawless and great at the same time. So, although not innovative in anyway, the game completely rises to the standards of its predecessors. You control a group of characters with different classes. Each time you can have up to 4 members in your party. The characters are varied, and you can develop them freely. You're always bound by the class you've chosen, but factors such as talents let you be free in shaping your character. This development is completely balanced. It won't take long before you become powerful enough to venture upon harder journeys, and yet unlike some games such as Fallout 3 you won't get too powerful that no one would be able to stop you. And it's very unlikely that you reach the level cap of your characters. This gets even gets more challenging and fun if you recruit as much character as you can and try to develop them all instead of merely sticking with four or five select characters. The game allows you to follow your own method in character development and party management. The system is complete in this aspect. The game also gives you a free hand in combat. When you press the Space button the game is paused and you can issue orders to your party members. But you can also give the orders real-time. You can move your character with mouse left click (by clicking on the ground) and you can also use the W-A-S-D buttons. You can adjust the camera as well. You can follow the game from an isometric perspective or adjust the camera to over-the-shoulder of your character like a 3D action game. So, the game let's you decide how action or RPG the game should be. You can follow the game in a purely RPG mode (isometric camera, turned based, mouse controls) or a very action-oriented mode (3rd person camera, real time, keyboard controls), or anything in the between. This is great in two aspects. First, it makes the game accessible to a larger variety of gamers. Second, a gamer like myself who enjoys different sorts of games can change his or her gaming method through playing for the sake of variety. The difficulty of the gameplay is also fairly balanced. The game appears to be a little deceptive in the story, and based on story you think you should first check the areas which turn out to be actually the harder parts of the game, while they were originally intended for higher levels. The developers have put almost unbeatable (for the lower levels) enemies at the gateway of these places, but it seems many gamers stubbornly go on playing without realizing that they can leave the place and go complete the quests on other parts of the world. If you do not fall into this trap and therefore wrongly accuse the game of being too hard, the game puts its difficulty level the same as a good foreign language teacher. A good foreign language teacher will adjust his or her level to yours, and the good adjustment is just one level higher than yours. So, if you're a starter, s/he will speak an elementary level. The game does that as well. The game is always slightly more difficult than your level, so it's never easy, but it's never too hard as well. This is in contrast with the more modern approach which the gamer is free to go anywhere they want and the other places become more difficult as you level up, and takes the more traditional approach of fixed enemies and quests. This is neither good nor bad in and of itself, what's important is the execution, and the execution is flawless. But none of the BioWare games (or most Western RPGs for that matter), are gameplay-driven, but are story-driven. Although the gameplay of Dragon Age: Origins is flawless and good, what makes it a true masterpiece is the great story and nothing else. I won't even post a summary of the story- but I'll mention it great points. First of all, let's begin with the fact that the game gets rid of the shallow and arbitrary morality system and doesn't label the gamer “good” or “bad”. However, your actions and decisions hugely affect the game, and change the course of the story. In a way, the game seems to present your choices as more pragmatic than moral, since you should think of how these actions will affect your progress. However, the game remains completely moral. How? The story is so engaging, so deep and you feel yourself so involved in the events that you feel obliged to try and find the more moral path. This is enough to show why this game is such a masterpiece. The game attaches no moral string to you and yet you're always preoccupied with morality. A very bold move, which is only possible with a very great story. At the beginning of the game, you can choose between different races and backgrounds. This will change the story of the game to a certain extent. The beginning of the story and your tutorial level will differ, but there will be small changes throughout the game, and even in expansion packs. This makes the game very replayable. The story is so exciting that you would normally want to play it, and this adds spice to a very delicious food. The story is also very deep. It deals with multiple issues. It deals deeply with religion and politics. In politics the game is completely agnostic: there's no definite answer. In religion, I still believe that the game is openly religious and sides with religion rather than with atheism. But many have disagreed with this interpretation. The point is whatever the alignment of the developers themselves, they portray all different sides with depth and therefore the game can be interpreted from multiple perspectives. Although the game takes place in a fictional universe it's completely relevant to our time and place. The game seems to take place in medieval time but it can only be developed by a person with a 21st century mentality. However, this doesn't mean that it doesn't have the charm of a medieval romance. The story is very suspenseful, very exciting, and full of elements which we love in a great fantasy, magic, war, blood, mythology. The story shares the main element of medieval romances; its praise of heroism, its tragic tone, and its action story. One must also point to the meticulous attention paid to the minute details. Fully detailed mythology, fully detailed history, geography, political system, all fantastic and realistic at the same time. This fully developed system is another sign of the greatness of the game, and I really hope it would be used in a lot more games. (At the time of writing, Dragon Age II has been released but I've not been lucky enough to try it yet). But none of this would be half enchanting if the characters of the game were one dimensional and half-assed. They're not. Each character is deep, real, and they all have personal quests which deal with their pasts. Their dialogues are written greatly, you can easily empathize with them, you grow to love them, and worry for their future. They all have their own personal worldview and taste. But have no doubt who's the greatest character of them all. 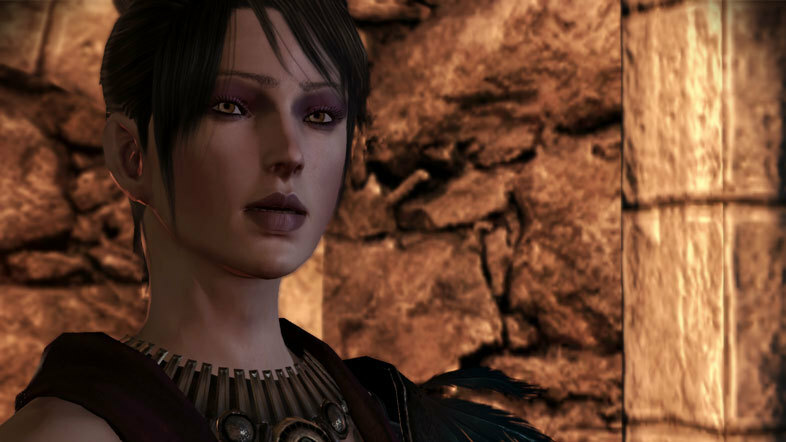 Morrigan is one of the finest and greatest achievements in video game history. She's one of the top 10 female characters of all times. She's evil and good, charming and frightening, deep, loveable and detestable. She's the deepest character of the row, presenting what's mysterious and dark and at the same time desirable in a woman. She's the most human of the characters. She's also the most unique. The graphics of the game is very masterfully done. The scenery in external locations is very beautiful and realistic, and the internal locations are greatly done. The animations are various and exciting. Characters look realistic and good and all of them except the main protagonist show their emotions through their face gestures. The blood effect is very violent and fun, and also realistic. For the first time- finally- after you kill someone you get soaked in blood. The music is very nice, it accompanies you in all the emotional and exciting moment, it's varied and its' effective. But then again, the greatest prize goes to voice acting. There are many famous names involved- Tim Russ, Steve Valentine, Kate Mulgrew and Claudia Black, and countless others, and they all convey the inner personality of their characters through their great voices. They convey emotions, and they all have beautiful and memorable voices. (I can still remember every sentenced uttered by Claudia Black who played a great role in making Morrigan who she is). In terms of voice acting, the standards of the game are comparable to the English voice acting of the Metal Gear Solid series which are the best voice actings in the history of video games. Finally, this game is a true masterpiece, you will get addicted to its great story and gameplay. Buy it, for you will be playing it multiple times.